So here it is! Our first house, oh yes, in it's original state. I have big plans for you house. Our dear house has already earned nicknames...The Cube, The Venue...we lovingly get to call it home. That doesn't mean we love all of it! :) We're going to be painting, dying, sewing, decorating, trimming, planting, grouting. We're also going to keep track of the transformation here, so if you're curious, or simply interested in seeing our stumbling first attempt at home ownership :), come back again! I LOVE stories. I LOVE books. I have to read almost every night to get to sleep. Because of this, over the years I have accrued my Favorite Books. My Favorite Books have really old ugly covers, bent out of shape. They have a shelf to themselves. I read them over, and over again. These are the books that accompany me on business trips; a little consistency with newness all around. As I am someone that always likes to try new things, these books are really the only form of entertainment that I come back to regularly. Hm, what do these have in common? Adventures naturally, told with beautiful words. Imperfect characters that create incredible circumstances. Overcoming. Love. Trial. Faith. Sacrifice. Joy. Mystery. Humor. Creative characters. Human condition. Books traditionally only make it to Favorite Book status over the course of several years; they are time tested. BUT. Announcement, breaking Lisa news. I think I've just added another, in record time. In a matter of one month, the Hunger Games trilogy has been inducted. I have already read all three books twice, and decided that, in addition to everything from my list above, the trilogy also has war, culture, food, rebellion, symbolism, love triangle, family, destitution, fashion....these books have it all. Only time will tell if it stays on the list. It may fade to second tier as I change, like Pride and Prejudice did, but I wouldn't be breaking the rules if I thought it was going to do that. Moral of the story; read The Hunger Games! The Paint the Street event in Over the Rhine (one of my favorite neighborhoods in Cinci). Sorry, they don't allow the vid to be embedded. 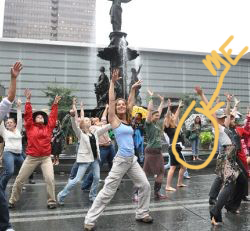 And also the Splash Dance (more often called flash mob) on Fountain Square, the central hub of downtown. The image below was used on the Cincinnati Fine Art Fund fundraising post cards this year. The spectators were great at this event....but the dancers were even better. Members of the Cincinnati Ballet coordinated and led the dance themselves. You can see my girl Amy in the second group that starts dancing; blond in the white shirt. All of the music is by Cincinnati musicians and groups! Moral of the story : do you know your city? Family is a word that means a lot to me; I don't really use it lightly. Sister, brother....they are strong and loaded words. I believe there are many kinds of family to be assigned, claimed, or given. There is biological family (which you can't choose, but I would have chosen mine anyway). There is church family (a beautiful societal support system). And there is friend-family. This is a shout out to my friend family. I think friend-families develop when a bunch a people that somehow found each other, and found an interest in each other, start to take on roles traditionally attributed to biological family. Trust, encouragement, loyalty, safety...taking care of one another. My husband and I are fiercely blessed, living away from all (but one - Double L!) of our biological/in-law family, to have a group that functions this way. The majority of the people I consider my friend-family are not in this picture, but I felt strangely happy to set up this alternative family photo at a church fall harvest party last weekend (think haystacks, campfires, and pig roast). We hopped right in line with the families of children and grandparents, the only group of adults, and said "cheese" for this exaggerated, ridiculous family photo. I am very grateful for all you friend-family people in my life! You are darling nuggets, and I'm glad you are in my adventures. The Clock-tower in downtown Monroe, WI, below this building thousands of cheese lovers are swarming. Photo by Kirsten, I think. There are very few cultural things I feel really attached to, but cheese is one of them. My dad grew up in the town of Monroe, WI, where the last Limburger cheese factory still operates, and where the biannual Cheese Days Festival draws thousands of cheese lovers from all over the country. Though my cheese-mania experiences were limited to visits to my grandparents house growing up, I still have a sense of family pride in, and even a snobbishness for, good, Wisconsin-made cheese. Annie's Cheese and Salami Sandwich. Basic but awesome. This September, my ENTIRE immediate family (it's only 6 of us, but it's still tough for us all to travel together), went to Monroe, WI to visit my grandparents and attend the Cheese Days Festival. The festival was all I hoped it would be. Swiss culture, hundreds of artisan cheese makers and other cheese based foods, local crafts (of which I always have a love-hate attitude toward.) We toured the Minhas Brewery which has been in operation for over 165 years and holds the largest beer memorabilia collection in the world (the whole basement room is surrounded by a wooden beam suspended from the ceiling, and on the beam are thousands of tap heads for thousands of beers). It was the quintessential Wisconsin experience...cheese and beer in a town square flavored by red brick and swiss stylings. But. All that culture, food, and activity isn't what I enjoyed most from that weekend. That Saturday night, my whole family sat down around the table to play a word game...Blurt or something. I remember my sister's voice projecting over everyone else, my dad playing when it wasn't his turn, and my grandpa, who's struggling with short term memory loss and general health, randomly throwing in correct answers when none of us "younger folk" could come up with them. My grandma sitting near, content to watch us be the maniacs that we are. THAT is the picture I want! I wish I was Cam Jansen. CLICK. Lesson from Cheese Days: Local festivals are always worth checking out because you get a sense of American culture or history. Also, family wins. My husband and I are quite familiar with the stretch of Highway 65 from Indianapolis to Chicago. We used to drive it all the time in order to see each other over the weekend when we were in a long distance relationship. When it was only one of us in the car, we'd be in a beeline to get to the other; high efficiency travel. Now that we are married, though, and most likely traveling together, we've allowed ourselves to take in the surroundings. And we found FairOaks Farm, right off Highway 65, in the middle of are we there yet Indiana. As you pull in, the sign reads "FairOaks Farms : A DAIRY ADVENTURE". You understand why we had to try this place! The facility operates on a HUGE dairy farm. A dairy museum tour is available for a small fee; there are milk, cheese, and cow themed playgrounds (Including the Dairy Air jumping pillow and String Cheese Maze). The actual cheese making is visible through glass walls of the gift shop and restaurant during week days. Oooh the restaurant; farm fresh ice-cream, cheese samples, and simple, homemade (down to the cheese and bread itself) grilled cheese sandwhiches. Heaven on earth. Not a whole $500 dollar wheel though. Just a wedge for us. Nope, Hooves, and Head! Illuminated to let the crowd know when to come inside and watch a baby cow pushed out by her mother. Sorry I didn't get a "Head" photo...we wanted to watch! The poor cow mother made me both proud and horrified to death as a fellow female. However, as the cow babies are born every 30min to an hour (they must have so many cows! ), it made me feel amazed watching such and important part of the lifecycle. It was my first live birth experience of any kind. Any combination of dairy and adventure is bound to be a positive experience, but FairOaks Farm was a real treat...especially in the middle of a multi-hour drive. The food is phenomenal, the education is experiential not cheesy (haha, okay it is cheesy in a literal way), and the setting is really very beautiful. Lesson from FairOaks Farms...if you see something intriguing from the road...STOP! You might get eat fresh farm foods!...or see cow innards. What Kind of Haitian Name is Steve? 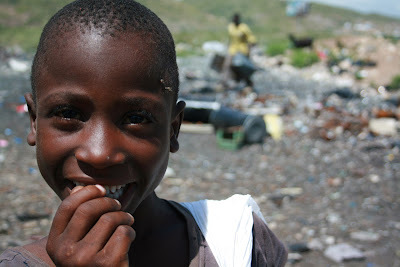 Meet Steve, my Haitian love. He is 8-12 years old, so (duh) I am not talking about romance. But this kid, though he has no idea, is in my prayers every day. After meeting him at a dump, I love him. Steve carries everything precious to him around in a zip-lock bag because it’s the only place he has to keep it safe. His ziplock bag has some coins, other knick-knacks, and a Kreyol gospel booklet. Steve represents Haiti to me: survival, smiles, poverty, hope. When I think of him, I wish I had hugged and kissed him more and made sure that he knew I would be praying for him. It’s hard to understand and process everything that you see in a new and struggling country in the moment. I really hope I’ll get to see Steve again.